During the summers from 2000 to 2010 I was in Newark, DE directing my annual Xylophone Institute at the University of Delaware. The host for that event was the professor of percussion at UDel, Harvey Price. 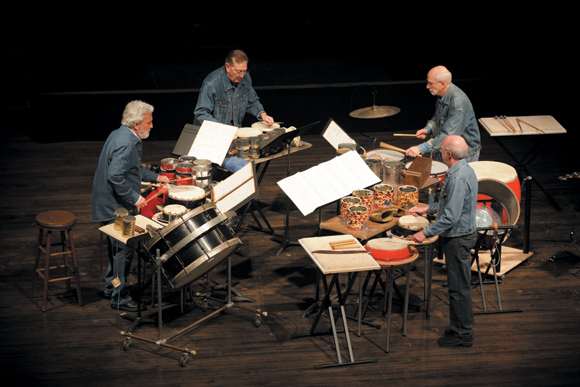 One day the topic of John Cage’s Third Construction came up in a conversation, and I told Harvey about the first time Cage heard NEXUS perform the piece (in January, 1982 at Toronto’s Convocation Hall). In 2011 I got an email from Harvey asking to clarify one of my comments. HP: I think I remember you, or maybe Bill Cahn, said that Cage was not crazy about the performance because of your choice of instruments. Do I have this story right? Was I dreaming? Is it close? Please clarify. BB: Hi Harvey. Cage heard NEXUS perform Third Construction several times – the last time was in Los Angeles in 1987. He never said he didn’t like our choice of instruments. The first time he heard us play it, both he and Merce Cunningham were in the audience, and when they came up on the stage afterwards Merce was crying – he said it was the first time he heard the rhythms played correctly (and he had played in the premiere of the piece). Cage said only one thing about the instruments we used, and he said it to me. I had chosen to use two medium size almglocken for the cowbells in my part – A and Eb, and I had them and my tin cans on a carpet-covered table top, so they could ring somewhat. I was trying to avoid the cliché jazz cowbell sound. Cage said: “This piece is not about resonance,” looking at my almglocken. He didn’t say “good” or “bad”. In fact, I can’t remember ever hearing him use either of those words in relation to anything. I still use those same almglocken when we play the piece now.